Laptops. Notebooks. Portables. Whatever you prefer to call them, they've done as much to change our digital lives as any other piece of hardware in the last quarter century. When the first laptops debuted in the early 1980s, they were a major breakthrough in convenience. For the first time you could use a computer that had a built-in keyboard, yet was so light you could pick it up and take it with you into the next room or on the train or plane into another time zone. But who could have predicted all the changes to come: Batteries that last all day, Mac and Windows operating systems coexisting peacefully on the same machine, the notebook as an entertainment unit? Twenty-six years after the first laptop appeared, we're commemorating the ten most important models to come down the pike. In chronological order, each of these notebooks represents a major turning point in technology, popularity, or both. Though we might snicker now at some of their laughably small screens or pitifully slow processors, they paved the way for today's powerful portables. Just as the Tin Lizzie was among automobiles, the Epson HX-20 was the first portable that was affordable to the masses, and it was simple. Although a handful of posers preceded it--including the 24.5-pound Osborne Computer--the HX-20 is widely considered to be the first true laptop. It weighed only 3.5 pounds and had a built-in nickel cadmium battery that lasted 50 hours on one charge. Of course, the "screen" was a tiny built-in monochrome LCD capable of displaying only four lines of text at a time. It also had a brown plastic case that closed over the keyboard, a built-in dot-matrix printer that spat out adding-machine paper, and a micro-cassette tape drive for storage. But its dual Hitachi 6301 processors running at 614 Hz, its 16K of RAM, and its serial and RS-232 ports blew the socks off its admirers--and thanks to their support, the HX-20 sold at least a quarter of a million units. For the deskbound accounting and "data collector" professionals at whom Epson pitched the HX-20, it was a portable dream come true. The 1980s were an exciting time to be a computer geek, and one big reason was the Tandy TRS-80 Model 100. Though the typical American family did not rush out to their corner RadioShack to buy a Micro Executive Workstation, it was the first laptop to become widely popular with early adopters. At 3.8 pounds and $800, it weighed and cost about the same as the HX-20, but it had a much bigger LCD (240 by 64 dots) that stretched all the way across the top. The TRS-80 Model 100 operated on four AA batteries for up to 18 hours. 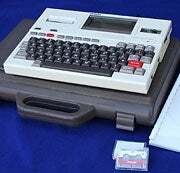 It had no internal storage (an external cassette recorder or a 5.25-inch floppy drive cost extra), but it offered a raft of built-in applications, including a text editor, an address book, a scheduler, and a telecom application for modem communications that was much beloved by newspaper reporters who finally had a way to dash off stories in the field. Legend has it that the firmware for the TRS-80 Model 100 was Bill Gates's last big coding project before he got sidetracked running an empire.